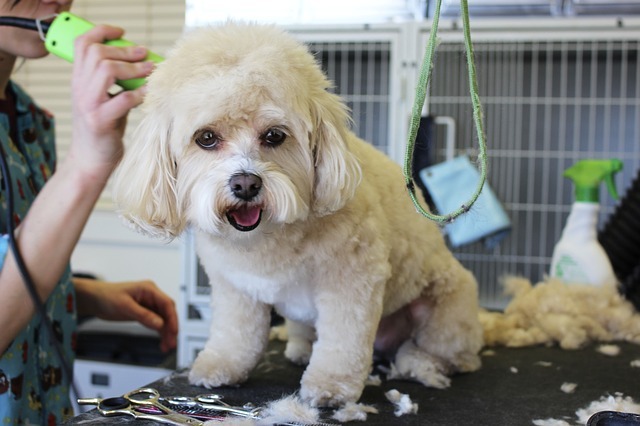 Dog Grooming: Do I Really Need to Use a Dog Grooming Table? Summary: If you think that you will be able to hold your dog still while at the same time giving him or her a haircut, then think again. You should invest in a sturdy dog grooming table. Trying to give your dog a haircut without a grooming table is a recipe for a rough looking haircut. Grooming tables are one of the handiest most used grooming tools. They are back savers. There are many different kinds of grooming tables. Some are hydraulic and adjustable to the height of each dog. Some grooming tables have a lazy susan table which the dogs are on. It can move as needed. Many of the grooming tables are electric so as to adjust as needed. Some grooming tables are built so that the dogs can walk on to them instead of being lifted on. Other grooming tables are portable and fold flat so it can easily be carried and moved to different locations. The grooming tables used for dog shows usually have casters and are extremely light weight. Some dog grooming tables come with the arm that is usually adjustable while others do not and the arm has to be purchased separately. Go Pet Club Dog Grooming Table is available at Amazon. ” Table features strong goal post style legs with rubber capped feet, Includes adjustable grooming arm, adjusts to 40 inches high.” This dog grooming table comes in various sizes depending on the size of your dog. All good grooming tables come with non-skid work surfaces and most of them are ribbed. When choosing a grooming table analyze your needs and try to get the best one that will meet your needs. With so many dog grooming tables to choose from, you will certainly find just the right one for you. If you have additional suggestions or have experience with dog grooming tables, we invite you to leave a comment or suggestion below. Puppy Ear Cropping: Do I really want cropped ears?